Plant Factory: An Indoor Vertical Farming System for Efficient Quality Food Production provides information on a field that is helping to offset the threats that unusual weather and shortages of land and natural resources bring to the food supply. 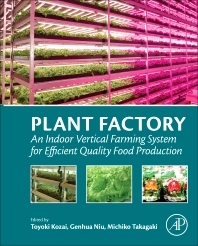 As alternative options are needed to ensure adequate and efficient production of food, this book represents the only available resource to take a practical approach to the planning, design, and implementation of plant factory (PF) practices to yield food crops. The PF systems described in this book are based on a plant production system with artificial (electric) lights and include case studies providing lessons learned and best practices from both industrial and crop specific programs. With insights into the economics as well as the science of PF programs, this book is ideal for those in academic as well as industrial settings. Japan Dome House Co., Ltd.
Sci Tech Farm Co., Ltd.
2002 Purple Ribbon Award from Prime Minister of Japanese Government for the academic achievement of environmental studies in biology. 1997 Japan Prize for Agricultural Science for the academic achievement “Growth Regulation and Mass-propagation of in vitro plantlets by Physical Environment Control” awarded by Japanese Academy of Agricultural Sciences and by Yomiuri Newspaper Co.
1992 Prize for academic achievement in “Environmental Control in Photoautotrophic Plant Tissue Culture” awarded by Japanese Society of Environment Control in Biology. 1991 Prize for academic achievement in “Fundamental Research on Environmental Control Methods for Factory-type Transplant Production” awarded by Japanese Society of High Technology in Agriculture. Dr. Genhua Niu is an off campus faculty at the Texas A&M AgriLife Research Center at El Paso with 100% Research Appointment. Her areas of special expertise are in environmental stress physiology and plant production in controlled environment. Her current research areas include identifying drought and salt tolerant low water use plant materials for urban landscape, quantifying growth and physiological responses of crops to drought, salt and heat stresses, and determining the minimum water requirement for urban landscape plants for maintaining a healthy landscape while conserving water. In addition, Dr. Niu is also working on evaluating the salt and drought tolerance of a range of bioenergy crops and vegetables for the semi-arid region. As a researcher at an off campus research center, Dr. Niu closely works with county extension agents on local extension programs. She also collaborates with faculty members at the Department of Horticultural Sciences, other research centers, and colleagues at other universities on research programs and graduate student education by co-advising and serving as a graduate committee member. In professional society service, Dr. Niu has been active by serving as officers of several working groups for American Society for Horticultural Science and USDA regional meetings. Extension Communications Award by Southern Region American Society for Horticultural Science. Mengmeng Gu, Dotty Woodson, Bart Drees, Steve George, Joe Masabni, Monte Nesbitt, Kevin Ong, Tony Provin, Benjamin Wherley, Doug Welsh, Genhua Niu, John Pitt, Christin LaChance, Charriss York, Richard White, James Thomas, Charles Fontanier, Jonathan Smith, Reagan Hejl. Bridget Fellow of Japan Society for Promotion of Science, 2010. Host: Chiba University from Nov 6 to Dec 11, 2010. USDA CSREES National Water Program Award for Outstanding Integrated Activities for Water Resources, Rio Grande Basin Initiative Team Member, 2007. First USDA national teamwork award for integrated water resources, ranked number 1 out of 37 nominations. Vice Chancellor’s Award in Excellence, Rio Grande Basin Initiative Team Member, 2006, Texas A&M University Agriculture Program. Post-doctoral research Fellowship of Japan Society for Promotion of Science (JSPS), 1997 - 1998, Chiba University, Japan. This book is a real scientific and practical book that you can use it for lecturing as well as handbook for using in a plant Factory.